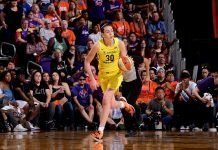 Uncasville, Conn.— It was only three nights ago that the Minnesota Lynx barely edged the Connecticut Sun. On Friday, however, Sylvia Fowles ensured that a different Lynx team took the floor, as she scored a game-high 20 points in Minnesota’s 14-point victory over the Sun. The game served as a nearly-perfect contrast to Tuesday’s match up in which the Lynx had 20 turnovers, while allowing Connecticut to secure 21 defensive rebounds. Friday Minnesota took control from the jump, and the Sun suffered their lowest scoring output of the season, scoring only 10 points in the first quarter and 68 for the entire contest. Connecticut’s early shooting woes allowed the Lynx to emerge with an early seven-point advantage. But the hosts had difficulties scoring all night, and entered halftime shooting a mere 25.7 percent from the field. This allowed Minnesota to stretch their nine-point halftime lead into a 26-point one midway through the third quarter. Fowles noted that in the days leading up to the game, the team’s focus was on ball security, while also emphasizing crashing the boards. “You think that was easy? We knew he had a lot of things we need to improve on from the first game,” Fowles said. Lynx coach Cheryl Reeve stressed that the Sun was still able to get easy looks at the basket. Rebekkah Brunson and Renee Montgomery each had 11 points for Minnesota, while Maya Moore grabbed a game-high 11 rebounds, ensuring that an 11 percent field goal percentage would not define her night. Sun coach Curt Miller acknowledged that his team’s effort was not the reason for Friday’s loss, citing his team’s multiple clean looks and ability to get to the basket. Even in the loss, Connecticut saw Lynetta Kizer match her season high with 12 points. Second-year guard Courtney Williams had nine points. The Sun will have no time to dwell on Friday’s performance, as they face a quick turnaround, paying a visit to Allstate Arena and the Chicago Sky on Sunday. The Lynx, meanwhile, will host the Stars on Sunday.